As 2018 comes to an end, interior designers and window specialists are looking forward to 2019. And they are predicting some of the biggest window trends to hit next year. As a homeowner you may not want to commit fully to a trendy look. But there is certainly inspiration to be found in these upcoming style choices! Whether you are inspired to fully revamp your home with new replacement vinyl windows from Great Lakes Window, or choose to incorporate smaller nods toward 2019’s biggest trends, we are sure that it will be a great year for your home. A sleek, modern style has been trending through 2018. This should continue to be hot into 2019 as well. Bright, modern windows add a lot of light to the interior of a home. Therefore, it’s not surprising that homeowners and designers are gravitating to this style. Window options such as our popular casement window fit in perfectly with a modern home aesthetic. 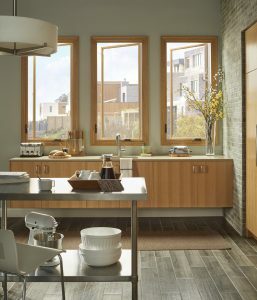 These vinyl windows open with a crank, using a fold-away nesting handle for clean lines without sacrificing function. To make the most of these windows, consider joining them together in double or triple combinations. The 2019 color trends offer something for everyone. From soft neutrals and pastels to bold palettes, you’re sure to find a great fit. For those who like the sun-kissed, light look, you can consider colors for your windows like classic white, soft beige. Or the slightly moody shark skin grey, combined with white, beige, or a classic wood finish inside. For those inspired by the more dramatic palettes of 2019, try dark bronze, evergreen, or even black for an eye-catching look. While these colors are certainly part of 2019’s trends, they are also classics that work with many decor styles. So you cannot go wrong when you choose from Great Lakes Windows design options. When you work with one of our Great Lakes Window dealers, your entire home design and color schemes are considered. The end result is window finishes that perfectly suit your property. Now more than ever, homeowners are aware of the impact their choices have on the environment. And how the outside environment can influence their homes. When it comes to interior design, 2019 is a year of choosing home features and finishes that look great, while promoting a green approach. To translate that to windows, think about the eco-friendly, energy efficient features your windows offer. Product lines like our ecoSmart windows are great for your home and for the environment. This line was awarded the ENERGY STAR Most Efficient recognition in 2018. Its smart features that offer insulation, durability, and enhanced thermal properties keep your home and the outdoor environment separate. The end result is a comfortable home for you, and lessened environmental impact since your home will be more efficient. The best part of following design trends is taking that inspiration and making it your own! At Great Lakes Window we know that all of our customers has different needs, goals, and requirements for their vinyl replacement windows. So we strive to ensure that every customer is fully satisfied with their windows. We’re happy to discuss design options, window features, and window styles with you, to ensure that every Great Lakes Window in your home is the perfect fit. Getting started with Great Lakes Window is as easy as finding one of our knowledgeable dealers. Click below to check out our online locator to find your nearest window expert, and get ready for a great 2019!